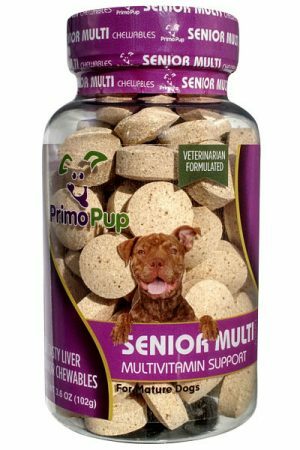 Primo Pup Multivitamins for senior dogs supply essential minerals and nutrients that are easy to digest and complement your pet’s normal diet to support their physical and mental well being. The Senior Multi Formula is developed by expert veterinarians to provide an optimal blend of nutritional support appropriate for mature dogs and is made with quality ingredients in a facility meeting human consumption standards. It is free of grains, artificial colors and artificial flavors. ⇒Tasty liver flavor your dog will love like a treat! ⇒Formulated specifically for the senior life stage to support overall physical and mental wellbeing. 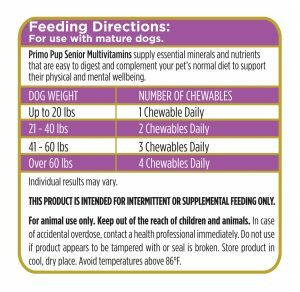 ⇒Complete multi-vitamin/mineral formula ensures dog’s diet contains adequate nutrition in an easy to digest formula. 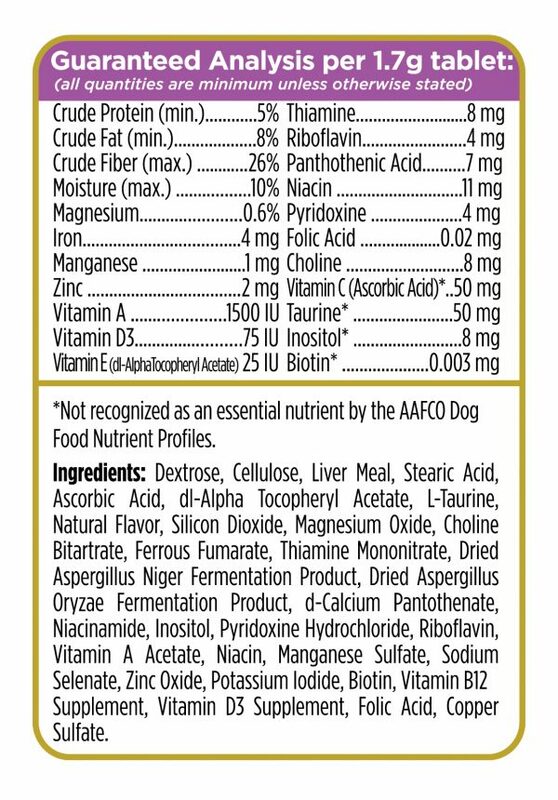 ⇒Supplements vitamins & nutrients lost in dog food manufacturing & those absent from raw food diets. 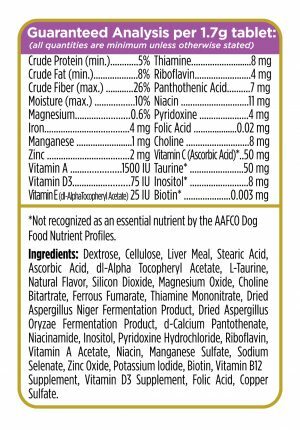 ⇒Made with quality ingredients in a facility meeting human consumption standards, grain free, no artificial colors or flavors, made in the USA, made with Certified Good Manufacturing Practices, lab tested for quality and purity, National Animal Supplement Council Certified. To increase engagement with your dog (which is never a bad thing!) we recommend using this a bonding and training opportunity and administering the appropriate dose as a reward for completing a task/command/trick. Doing so not only ensures good health, but also provides a daily training routine that both you and your dog will look forward to. Have to be supplied on a daily basis because they are continually broken down and excreted. 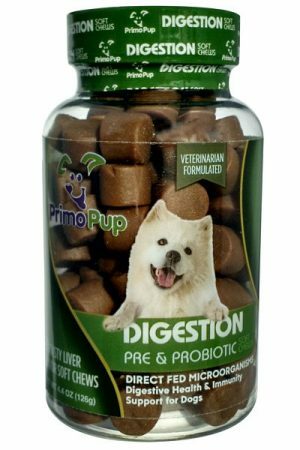 Promotes a good appetite and normal growth. Is required for energy production. Important in the metabolism of proteins and in the formation of red blood cells. Required for energy and for protein metabolism. A constituent of many enzymes that process carbohydrates, proteins and fats. Works together with vitamin B12 in many of the bodies chemical reactions. A component of several important enzyme systems. Required for proper transmission of nerve impulses and for utilization of sulfur-containing amino acids. Participates in the formation of bones, teeth and soft tissue. Is an antioxidant that is helpful during times of stress. It is abundant in fresh foods, but is killed during the high temperature processing of dog foods. Necessary for proper vision, especially night vision. Important in bone growth, reproduction, and maintenance of tissues such as the lungs, intestines and skin. 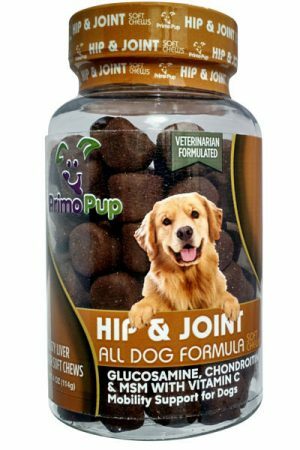 Critical to the dog’s ability to use calcium and phosphorus for bone and cartilage growth and maintenance. An Antioxidant that protects cells from oxidative damage. Especially important for muscular and reproductive function. Helpful during times of stress. Is abundant in fresh foods, but is killed during the high temperature processing of dog foods. Primary function is to keep fats collecting from the body particularly in the liver. It is efficient in converting nutrients into energy. The highest levels of Inositol concentrations are found in the heart and brain; inositol works with neurotransmitters in message circulation. MINERALS: Minerals are present in small amounts in the tissues of all living things. Teeth, bones, muscles and nerves have especially high mineral content. Minerals can be divided into two groups: the major minerals and the trace minerals. Essential for many of the cells enzymatic reactions. Also helps promote the absorption and metabolism of many other vitamins and minerals, including vitamins C and E, calcium and phosphorus. Important in bone growth and development. Required in milligrams or microgram amounts per day. Is present in every cell in the body. It is particularly important, along with protein and copper, for the production of red blood cells, which are responsible for transporting oxygen from the lungs to every part of the body. A component of many different enzyme systems in the body. Most importantly it activates enzymes that regulate nutrient metabolism. Important in the metabolism of several vitamins, particularly the B-vitamins. Zinc is also a component of several enzymes needed for digestion and metabolism and it promotes healing as well. 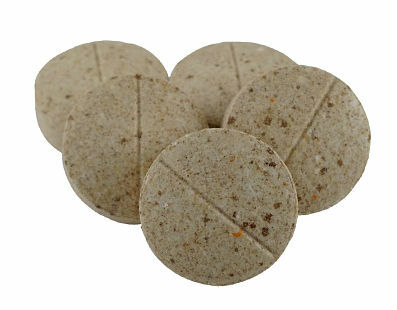 Your dog needs zinc for proper coat health. Found in several organs with widespread benefits. Taurine’s direct roles include: Maintaining proper hydration and electrolyte balance in cells, forming bile salts, which play an important role in digestion, regulating minerals such as calcium within cells, supporting the general function of the central nervous system and eyes, regulating immune system health and antioxidant function. Should I Give My Dog A Multivitamin? 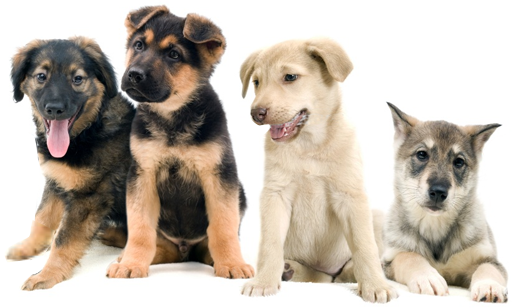 As in people, the benefits of supplementation has been well documented in pets. Accounting for deficiencies in key vitamins & nutrients helps to maintain general health & helps to keep our pets in peak condition. How Can A Multivitamin Help? 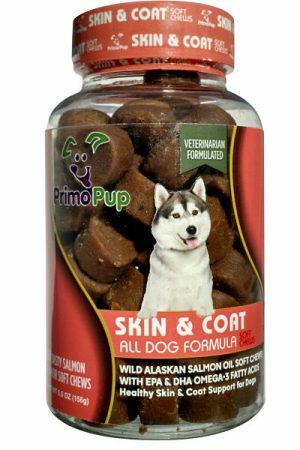 Primo Pup Multivitamins are easy to digest & compliment your pet’s normal diet to support their physical & mental wellbeing. What Makes Multivitamin Supplements Effective? 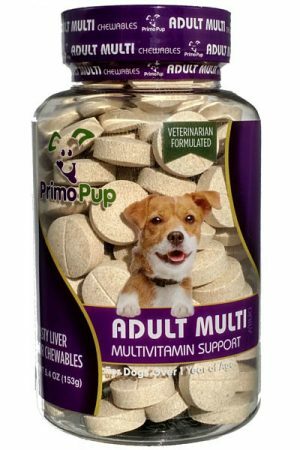 Primo Pup Multivitamins are veterinarian formulated to provide an optimum blend of essential minerals & nutrients appropriate to a pet’s life stage from puppy to adult to senior. 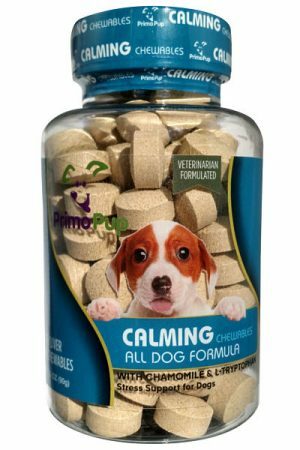 Our supplements are formulated by a skilled team of veterinarians & nutritionists with a focus on creating a healthy supplement with the optimal blend of active ingredients for canine companion animals. We manufacture in the USA under strict supervision using Good Manufacturing Practices with high quality ingredients & lab test for purity & safety. We are audited members of the NASC - the gold standard in pet supplement regulation. Are The Multivitamin Supplements Tasty? 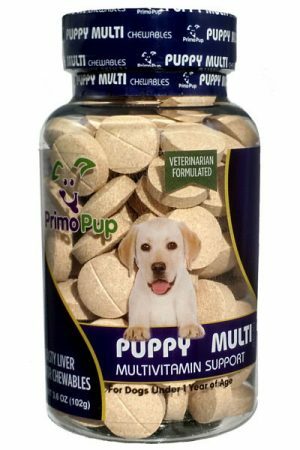 Primo Pup Multivitamin supplements are chewable liver flavored tablets. We perform extensive palate testing & find most dogs like them as much as their favorite treat. Dextrose, Cellulose, Liver Meal, Stearic Acid, Ascorbic Acid, dl-Alpha Tocopheryl Acetate, L-Taurine, Natural Flavor, Silicon Dioxide, Magnesium Oxide, Choline Bitartrate, Ferrous Fumarate, Thiamine Mononitrate, Dried Aspergillus Niger Fermentation Product, Dried Aspergillus Oryzae Fermentation Product, d-Calcium Pantothenate, Niacinamide, Inositol, Pyridoxine Hydrochloride, Riboflavin, Vitamin A Acetate, Niacin, Manganese Sulfate, Sodium Selenate, Zinc Oxide, Potassium Iodide, Biotin, Vitamin B12 Supplement, Vitamin D3 Supplement, Folic Acid, Copper Sulfate. She is more alert and eating. “Dog loves them and they seem to be working. Need a bit more time and will know for sure. Great pickup for my 9 yr old lab. He was starting to show sluggishness with age. These vitamins are definitely a 5 star. THIS PRODUCT INTENDED FOR INTERMITTENT OR SUPPLEMENTAL FEEDING ONLY. For animal use only. Keep out of reach of children and animals. In case of accidental overdose, contact a healthcare professional immediately. Do not use if product appears to be tampered with or seal is broken. Store product in a cool, dry place. Avoid temperatures above 86°F.